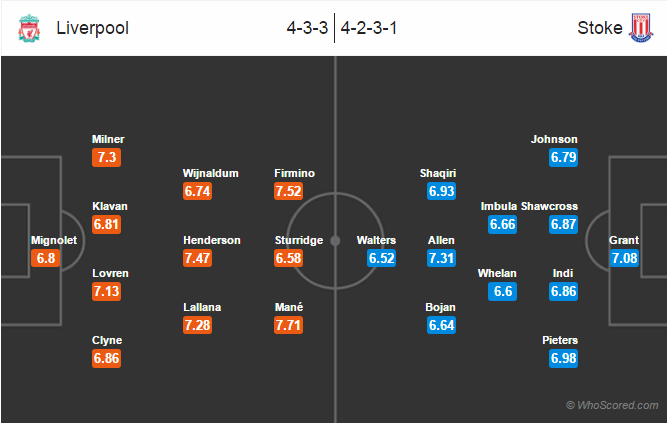 Premier League match preview Liverpool vs Stoke City, game week 18. Important things to know. Referee: Michael Oliver, Stream Guide: Watch Live. Jurgen Klopp will be without Philippe Coutinho and Danny Ings for tonight’s game. The former is expected to return in the next few days. Daniel Sturridge is likely to be back in the starting lineup after an impressive impact agasint Everton last week. Joel Matip remains doubtful through ankle injury. Ragnar Klavan has been impressing in his absence, he is likely to continue. Xherdan Shaqiri would be eyeing for a return to the lineup after being dropped out last week. Bojan return after a month and impressed with a goal in the last game, he is likely to get a starting node. Marko Arnautovic is out through suspension. While Marc Muniesa is doubtful through injury. Ibrahim Afellay, Stephen Ireland, Jack Butland and Phil Bardsley are all on the sidelines through injury. Liverpool have won five of their last six games against Stoke City. Liverpool are unbeaten in their last three Premier League games. Stoke City have not won any of their last three league games. Liverpool are unbeaten in their last 15 home league games. Liverpool have lost only one of their last ten home games against Stoke in all campaigns. Liverpool 2 – 1 Stoke City, Daniel Sturridge on the scoresheet for the home side.